Throughout 2017, Dunn Solutions will keep up with Daniel Westbrook as he renovates this historic Seattle residence. This video and post are a part of the ongoing series. For other related posts, click here. Pocket doors are a fantastic space saver which use a wall cavity to hide the door as it slides open. Pocket doors offer a reduced footprint by eliminating swing that you would expect to find on a standard hinged door. This makes pocket doors especially useful in tight footprint designs where space is a valuable commodity, such as areas where a hinged door might become an inefficient barrier between one room and the next. They also don't need to sweep into (or alongside) a wall, which creates precious wall and floor space for everything from cabinets to furniture. Pocket doors require much more planning and layout than standard doors do, though. For instance, the wall cavity can’t be used to house utilities such as plumbing or wiring. Another thing worth considering: Pocket door studs are a lot more flexible than standard framing, so there are limitations if you're planning other uses for the adjacent wall (such as hanging cabinets or installing wall tile). The tolerances for adjustment on pocket doors are limited, and need to be planned for right from rough framing. In our project, we have very close proximity of a stove, hood vent, cabinets, countertops, electrical, floor-to-ceiling wall tile, soffit framing, and the lines of a historic home which are not plumb! As you can see, planning and layout are critical. But if you take the time to plan correctly, the process is smooth and the results are worth it. 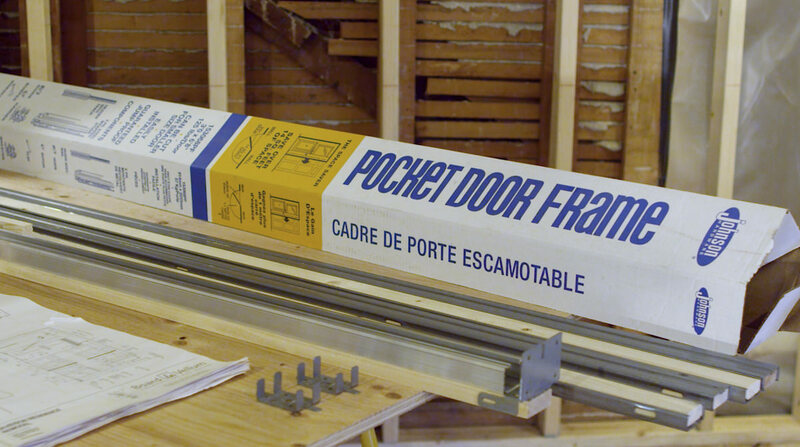 There are quite a few pocket door frame manufacturers out there, but I like the Johnson pocket door frame because it can be used in a standard way, or modified for custom applications. It has a solid aluminum track and wood studs wrapped in heavy metal for added strength. Plus, it comes in pieces, so I can buy two or three kits and add more studs, or put two together for a double door application. For our project, we'll be doing a pretty standard installation of a single pocket door (with the exception of the layout, plumb, and level considerations). In any case, I recommend reading the pocket door install instructions before layout. You can also get the Johnson pocket door hardware kit at Dunn Lumber. Once familiar with the rough opening framing size required for the door, it’s time for the layout to begin. As you're getting things situated, be sure to locate all of the pocket studs, king studs, trimmers, and the header. Before any wall framing goes in, I layout the floor with all the layers of product being installed—from rough framing to the finishing trim. When I’m done, there will be a full size architectural drawing on the ground, so I can see how everything will fit together. Next, I always set up a laser level. The laser level is a great tool for layout in that it gives me a point of reference to line up all horizontal lines across a remodel. In this case, it's a critical tool because all the lines of the head trim, tile, soffit, and cabinet tops need to be parallel. Otherwise it will be easy for the eye to see any lines that don’t match—causing a glaring mistake that can’t be fixed! So my laser is set up along with my straight-edge levels, as well as a story pole with locations of horizontal intersections that can be referenced off the laser line. All this planning and layout is done so there is minimal possibility of miscalculation when we get to framing the pocket door. Once the layout is done, I install the bottom and top plates as would be normal, as well as the wall studs and king studs. The procedure on this framing install is a little different, because the header at one end intersects with a beam. To address this, I've customized the header for that interface. One important thing to mention: I really like solid headers, even in interior applications. Be sure to check the beam height with the story pole off the laser line to be sure it's in the right place. Once the king studs, beam, and trimmers are installed, it’s time to install the pocket door kit. I installed a spacer piece of plywood on the floor so the pocket stud bases have something flat to sit on (the sub floor was an irregular shiplap). I also put blocking in the floor cavity below, so the stud base screws secure to something nice and solid. First cut the track according to the directions, and install with screws. Then cut and install the pocket studs as per the directions. I like cutting the studs with a jigsaw that has a bimetal blade. Once the framing is in place, it’s a good time to double-check everything just as a precaution. 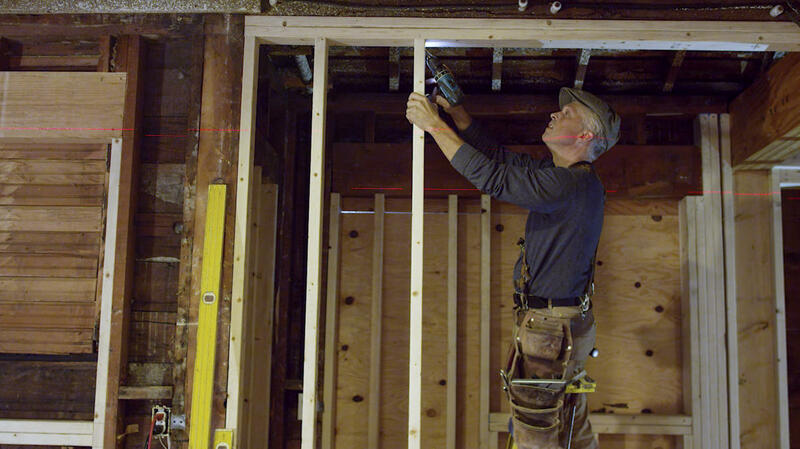 One little trick I like to do (that isn’t in the directions) is pre-fit the pocket door by hanging it in the framing before any drywall is installed. 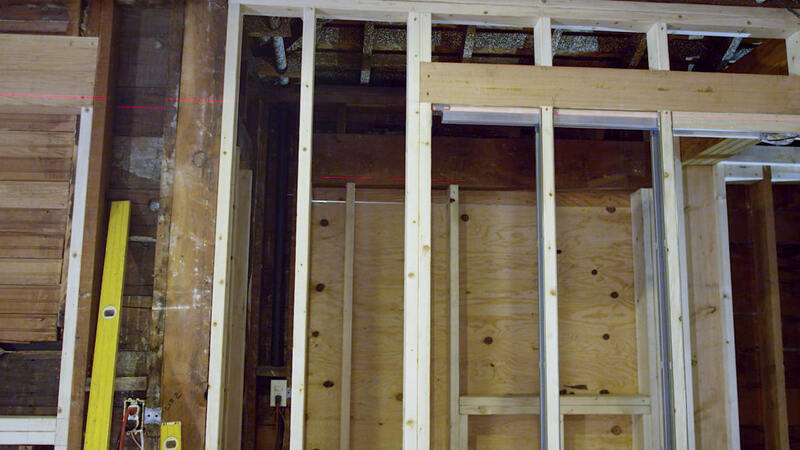 This allows me to see how the door is going to fit with my trim work, and if I need to move the framing for any reason—now is a good time to do it. Another little trick I'll use is putting the little rubber stop directly on the rough framing stud instead of the door edge like the directions say to do. Once I’m satisfied with the fit, I’ll remove the pocket door and store it somewhere. Many times it’s not practical to have the finish door slabs on site, so it’s not a necessity. Pocket doors are a quality alternative to conventional hinged doors, because they save valuable floor and wall space while offering a finished look. It’s very important to take the time to pre-plan the space and perform proper layout, because layout is the time to catch any flaws that may exist. 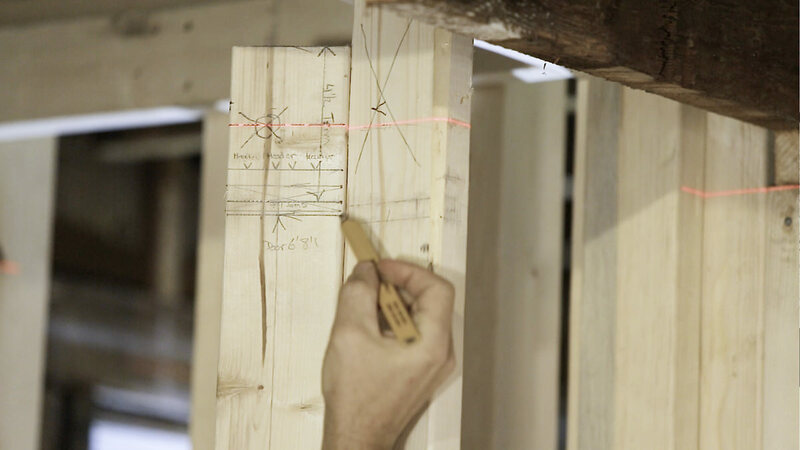 Use a laser level, story pole, and a level for consistency in layout (and for double-checking the framing), because once drywall goes in—there is no turning back! Look for another video coming soon from the second part of our two-part series, which will guide you through the installation process on a pocket door and trim. Volunteer Rob Carlisle of Carlisle Classic Homes discusses the Rampathon experience and the joy of providing wheelchair accessibility for homes in our community. Where Is the Largest Opportunity for Energy Saving in the Building Sector? Existing buildings have the greatest opportunity to change the energy picture in this country, as well as the health and safety of its occupants. Mark LaLiberte and Daniel Westbrook discuss climate in the Pacific Northwest, managing humidity, and other ways to protect your home during a remodel or energy retrofit.